When Tara told Seth about the beachfront cottage she'd found at the Palm Grove Lodge, she said it was more Maldives-ish than our ocean-view room at the Edgewater Resort. She was 100% correct. Less than 30 minutes after settling in at Palm Grove, we knew we'd made the right decision to move (even though we'd decided two days before to settle into Edgewater for a full 7 nights). We settled into our cottage quickly and spent a lot of time admiring the view. Snorkeling was our big daily activity. We snorkeled in three places on the island: in front of the Edgewater Resort, in front of Palm Grove Lodges and 6 houses to the right of The Fruits of Rarotonga. We loved the tropical fish life and occasionally we'd come across very healthy looking interesting coral. At the Edgewater, we found that everyone crowded around the pool to watch the sun set. We, however, walked four minutes down the beach and had the sunset nearly all to ourselves. There were even two lounge chairs nicely positioned on the beach for us to enjoy the sunset from. The sun would set directly in front of us out across the ocean. The colors were pretty as the sun set and the stars came out - especially the various hues of blue. We could see the stars well from the beach and also from our balcony. At Palm Grove we were facing Southwest, so the sun set far to the right on the beach, behind the palm trees. We found that if we walked out on the shore to where the sand jutted into the ocean, the view was improved. Our first night we even took out a kayak to get further out for the sunset. One night at Palm Grove we had a totally clear view of the sky and the stars were spectacular. We must have spent three hours laying on two beach chairs, gazing up at the sky, learning consellations. The fact that we can clearly idnetify the Southern Cross now is kool. The last night we enjoyed the best sunset of the island. The day had been overcast and rainy. Instead of going into town and doing errands, we stayed in all day. Seth played his computer game while Tara read, wrote postcards and slept. Tara informed Seth that it was last chance to see the sunset and was very glad to see him running out of our cottage onto the beach ten minutes later. The sunset was brilliantly gold to the West and a double rainbow was visible to the East since it was slightly raining. It was only us, our Scottish neighbors and the friendly beach-dog who were out to enjoy the spectacular colors. We went kayaking during the day also to get a closer look at the amazingly huge waves which were crashing against the outer, fringing reef. It was neat to see the waves, but Tara could not control her boat well enough. At first, she kept trying to be very close to Seth. Finally she succeeded only to have her boat knocking against his boat annoy Seth. Then, she kept drifting off much quicker than Seth and had to struggle to stay awa from the big waves. Paddling was hard work and both our arms hurt afterwards. Even so, it was neat to see the reef further out and get close to the BIG, powerful waves. Tara's big daily activity was to walk around the island. This started when she went hunting for other places to stay on our first day. These are some impressions of where she saw. Crown Beach Resort - Cute round buildings. Only a couple directly on the beach. Pool inland. Friendly front desk lady. The rectangular shaped beachfront building I was offered for NZ$595 was very spacious, but older. The balcony was not covered. Not worth the price. Sunhaven Beach Bungalows - Three very new, beachfront cottages with balconies situated directly on the beach. Crappy beach even though it had been raked. Smelled like fish. Lots of debris. Very friendly Front Desk lady. Only two nights availability at NZ$295 in a beachfront. NZ$90 for the Fijian workers room who had returned to Fiji. No personal outside space - only a big picture window. Fourth cottage set behind the beachfront three. Lagoon Lodges - Totally unfriendly, unhelpful desk staff. Not on the beach, but across the road. Cute 2-bedroom units, older 1-bedroom units. The Rarotongan Resort - Good first impression from the bright outside colors. But, "Words left unsaid" just like at the Edgewater. I was kept waiting for a LONG time when I asked to see a beachfront room. The beachfront room inside was dark and the bathroom was DESPERATELY in need of a remodel. Day 4 walk was enjoyable. We went to Muri Beach, ate at Sails ("if the music is too loud, you're too old" Seth) Then, we surprisingly found an internet cafe. We then were walking until the 6:10pm bus. We detoured from the road, where there were big crabs, to the beach at Tropical Sands. We found big, round, red shells! It was much wilder here on the East side. There was also the beach dog who stayed with us the whole way. When we tried to cut back to the road, a dog viciously barked at us, so we kept to the beach an miseed the bus. We were walking, it was getting dark, and a friendly family (who we'd asked abou tthe bus a while before) was driving into town. We climbed in the back of their pickupand they dropeed us off just outside Portifiino's an italina restaurant Seth had wanted to eat at. Yummy food. Poking around the fisheries office at 8pm while we waited for the 9pm bus was also kool. The sea life we'd seen in Fiji was the Taramea (it sucked coral white). We moved to the Palm Grove Lodge since we had such a hard time communicating with the staff at the Edgewater Resort. The facilities were fine. We had an nice view of the ocean from room 207, a big palm tree to shade us during the day, sunset views directly out across the ocean, tasty room-service food, and fine snorkeling (once we managed to get equipment). Words left unsaid at the Edgewater Resort. 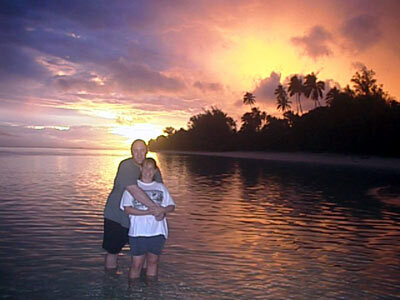 As soon as we arrived at the Edgewater Resort in the Cook Islands, we noticed how laid-back everyone was. We then began to noice that especially in terms of speaking, we needed to infer a lot or ask a lot of leading questions since words were left unsaid. Tara "Hi, I cannot find a room service menu in my room - where might it be?" Room Service "What is your room number?" hmmmm, Tara inferred that she might be getting a menu delivered to her room, but there was doubt in her mind since nothing was said! Eventually, the menu showed up at the door. We ordered room service every day of our stay and not once did utensils come with our food. Good thing we bought a fork, knife and spoon from a flea market in Melbourne. A few days into our stay, Tara actually discovered forkes and knives hidden away in a cabinet near the refridgerator. So, I guess room service figured we'd use those utensils. But, again, the words were left unsaid - no one advised us that there was cutlery in that cabinet. Tara "Hi, Where is Hut 15"? Front Desk Staff "Hut 15?" Tara "Yes, where your board says their is an island walk now." Front Desk Staff "OK. Go to the restaurant, they'll show you." Tara walks to the restaurant and asks. Tara "Hi, Where is Hut 15?" Restaurant Staff "Right there" pointing out to an uncleaned breakfast table outside. Tara "Um, I saw on the activities board that there is an island walk at 9am - is that the meeting place?" Restaurant Staff "I don't see them around." Tara "Them? Has the island walk already left?" Restaurant Staff "I don't know. Maybe they'll come later." Tara, a bit bewildered, sat near "Hut 15" - which is really just a table outside the restaurant. Ten minutes pass, Tara goes back to a person in the restaurant. Tara "Hi, I was waiting for the island walk at 9am - but no one is here - has it been cancelled?" Restaurant Staff "I don't see them." Tara decides to go on on her own island walk. Seth and Tara want to join the 2pm snorkeling and fish feeding activity. The Activities guy tries to make 5 bucks, 5 bucks, 5 bucks. The conversation about where the 2pm activity was being held was similar to the 9am activity. In the end, there really was no 2pm activity. So, we decided to go snorkeling ourselves. We go to the activities center to pick up (as advertised in the hotel literature) our "first 2 hours free" snorkeling gear. First, the guy working has to turn down his extremely loud rap music to hear us talk. He also had no idea of where the 2pm snorkeling tour was since he was "separate from the hotel". So, we ask for snorkeling gear. Activity Guy "That will be $5 for 24 hours"
Tara "What about the 2 free hours of snorkeling gear?" Activity Guy "As I said, we are separate from the hotel." Activity Guy "I need cash." Seth "OK. We'll be back." We walk to our room, grab a $20, and decide to put our tickets, passports, etc. in the hotel's safe deposit box. Seth "Hi, I want to put this in a safe deposit box." Front Desk "How many days?" Seth "How many days what?" Tara "We check out on the 24th." Front Desk "How many days is that?" In the end, we calculate 5 days and we are CHARGED $10 to put our stuff in a safe deposit box (that was a first for both of us). So, now we have $10 and we go back to the Activity center. Seth is holding the $10 in plain view. Activity Guy Looks at us and at the $10 bill and says "How many?" Seth "Well, both of us want to go snorkeling." Activity Guy "That's $20 then. $5 for maks $5 for fins each." Seth and Tara, flabergasted, don't know what to say for a moment. Seth "Forget it. We aren't going snorkeling today." The next morning, it gets better. Tara complains to a manager that neither the 9am walking tour, nor the 2pm fish feeding and snorkeling tour occured yesterday. Plus, she said that 2 hour free snorkels were not avaialble. The manager says he'll fix it and walks with Tara over to the Activities Center. Manager "Give this lady her two free snorkels for 24 hours." Activity Guy smiles a big stupid-looking smile and says nothing, chuccles a little. Manager leaves. Tara "The manager said 24 hours. I can have them back by 10am tomorrow." Activity Guy "Ok. That will be $5." Activity Guy "You have to pay the $5." Tara "I give up! I don't want to go snorkeling." And she leaves the Activity Center to continue her walk around the island. Good thing really that the Activity Guy was so hard to deal with - since on her walk she found the Palm Grove Lodge - where we ended up spending four days in paradise. Accommodation - Edgewater Resort -facilities were fine. Staff and service lacked. (the 400 block of rooms would be the best beachfront rooms). We considered our room, 207,more of an ocean view since it was set back, behind the pool. Beachfront cottage #B1 was excellent. B1 to B5 were closer to the beach (with B1 being THE closest) than B6, 7 & 8 were set back a ways, behind a creek that had a high iron content based upon its color.